Tommy Robinson, political activist, co-founder, spokesman and leader of the EDL. When preparing work for public view, it increasingly becomes evident that the edit is a vital component in the development of work. The representation of a person or event is manipulated by the photographer deliberately and accidently in many different ways in the moment. The audience, who do not necessarily share the views of the artist or subject, project thoughts and feelings into any interpretation regardless of original intent. When attempting to select an image that in some way represents a politician or political activist, there is a consideration that the subject is already infected with multiple memes attached to their persona. The very act of publishing an image irrespective of its implied critique or celebration can feed the cult of personality around an individual who uses the powers of politics to enable their pursuit of personal power. An image can be presented in any context that changes the way it is viewed. I recall photographing Peter Tatchell and his distrust of me as the photographer in representing him by a certain camera angle or lighting that he perceived as critical. With my portrait of Peter Mandleson and Alastair Campbell I managed to circumvent their cynicism through representing myself as something I was not. The experienced politician is continually vigilant and cautious of agreeing to any intimate session with a photographer. The only time that they are exposed to any uncontrollable scrutiny and potential manipulation is in public appearances and there are many great examples of revealing images that have defined careers positively and negatively in these fleeting moments, usually engaging with the ‘great unwashed’. With Mr. Robinson, this cautiousness with the media does not apply, there is no image in all my files of him (and other representations of him online) that damage the persona. The shouty, ranty Tommy both satisfies the expectation of the liberal left and the far right. Posting any attempt to reflect his humanity feels like a betrayal of the expectation of me as a liberal leftist. Everything is infected with propaganda. The primary image I have chosen to share follows the classic Italian fascist aesthetic, a pastiche of a Mussolini bust, half enveloped by the darkness. Perhaps I am judging him as a white, slightly puffy man with a crew cut as satisfying some of the visual criteria that might lead one to a stereotype. Photography can do that, there is always an objective element, a documentation of a subject's choice of representation. As audience we can chose to interpret this image as accurate or see it as a discussion on the unfair representation of a political activist expressing their right to free speech. 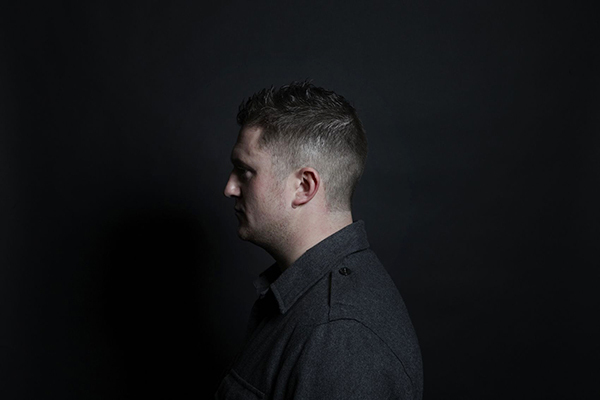 To be fair to Tommy, this image is taken out of context; it was shot as part of a composite image with a known extreme Islamist who I shot separately on the same day (a decision was made not to have them in the same room for the same reasons I would have done so). I am an artist under the guise of a portrait photographer so I am not uncomfortable manipulating and distorting the context of truthful representation it is my USP clearly set out in my statement. Beyond the fact that Mr. Robinson is in the news at this moment, the question to be asked is why am I not showing the image of the radical Imam? Perhaps I hold Tommy to a higher standard but I feel a sense of disappointment in those who respond to perceived threat with an equal and opposite reaction and in the process loose the high ground. My interest is Mr. Robinson himself. What is clear is that being in the room with anyone who represents a dangerous concept as part of their very persona, commands the attention and influence over others whose views are less than nuanced and who has become used to being exposed to the most dangerous of political forces, is uncomfortable and therefore of great interest to me on a human level as a portrait.